I’ve had my Rogue Ohio Deadlift Bar since June of 2016, just a couple months after it was initially released by Rogue, hot off the heels of the 2016 Arnold Strongman Classic competition where they used the super impressive one-of-a-kind Rogue Elephant Deadlift Bar. I hadn’t used a deadlift bar before, so I had lots of misconceptions about how it would affect my deadlifts. I’m not only going to review this bar and how it has held up and performed during my training, but also let you know what to expect if you’re considering using a deadlift bar for the first time. Deadlift bars are one-trick ponies. This specialized power bar is only used on deadlifts and isn’t used in any other lift. There is some amount of misinformation circulating about just how deadlift bars work or why you would want one. The biggest myth floating around is “deadlift bars significantly alter your deadlift range of motion.” It’s simply not true. Since 27mm deadlift bars are a smaller diameter than 29mm power bars, they do indeed display more flex than their stiffer counterparts. There are two parts of this to address though: 29mm bars still flex, and the flex at the apex doesn’t equal reduced ROM. I had a friend of mine who is an engineer run several calculations for me about this earlier this summer, and the difference in flex at the apex of the bar (where the highest amount of flex would be displayed) between an Ohio Power Bar and an Ohio Deadlift Bar with 600 lbs of Rogue competition plates was less than 0.65” once the full weight of the plates was off the platform. However, the lifter doesn’t grip the bar at the apex which means the effective ROM decrease was less than 0.50”, and the lifter still has to pull a very large percentage of the weight lifted for that half inch. So unless you’re a very short lifter pulling sumo and whose ROM is only a foot off the platform, the small ROM difference won’t add pounds (or kilos) to your deadlift. Further, if your sticking point isn’t literally off the floor, that small difference won’t affect your pull at all. If you ARE pulling sumo with a really short ROM, it will give you some extra kilos on the platform. So why would you want a deadlift bar then? The biggest advantage a deadlift bar affords a lifter is greatly improved grip. Since diameter is related to circumference by π, that 2mm smaller diameter translates into a 6mm smaller circumference. A smaller bar shaft is much easier to hold on to and far less likely to slip from a lifter’s hand, especially during a one rep max. Think about how much harder it is to grip a 2” fat bar than a regular power bar and you’ll quickly realize that smaller bars are easier to hold on to than larger bars. This means if your grip is limiting your deadlift, then your pull will greatly benefit from a deadlift bar. An easy way to know if this is applicable to you or not is as simple as knowing if you pull significantly more weight with straps vs. alternate grip. Couple this smaller shaft diameter with very aggressive knurl, and you have a barbell that will never slip during heavy pulls. Editor’s Note: For some great advice on deadlift training, see Nerd Fitness’s article about working up to a 400lb deadlift. The other (much smaller) advantage is that it allows sumo lifters to take a wider stance since there is more distance between the collars on a deadlift bar. This mostly applies to the taller lifters and is a nice balance against the small ROM difference for the very short lifters. 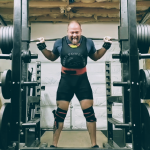 The bar has about 4” more space between the sleeves, so if you’re a toes-to-plates sumo puller, you’ll have a little more room for your starting position. There are two finishes available on the Ohio Deadlift Bar: bare steel at $295 and black zinc at $355. Bare steel feels superior to the black zinc but has no protection against oxidization. If your lifting environment is very humid you will have to perform regular bar maintenance on the bare steel version while the black zinc will be a low maintenance option. My insulated but not climate controlled garage in Georgia hasn’t given me any issues with only cleaning my bar once a month or so. My maintenance routine is to simply hit the areas that have caked up chalk with a stiff bristled nylon brush and then to wipe the bar down with a rag lightly coated in WD-40. Given time (and even less time If you have multiple people lifting on it), the bare steel bar will eventually develop a beautiful patina. Outside of the dimensions, the materials and construction are similar to the Ohio Power Bar. It uses the 190k tensile strength shaft, snap ring construction on the sleeves, and bronze bushings. The pattern on the knurl is the same aggressive knurl on both bars, but it is actually cut deeper on the Ohio Deadlift Bar. No center knurl is present since it won’t be used for squats, but it does have powerlifting rings. The sleeves have ¾” less loadable sleeve length than the power bar at 15.5”, and a longer shaft at 90.5” with 56” between sleeves instead of 86.5” and 51.5” respectively on the Power Bar. All of the sleeve edges are chamfered and the sleeves have very shallow ridges from the milling process. 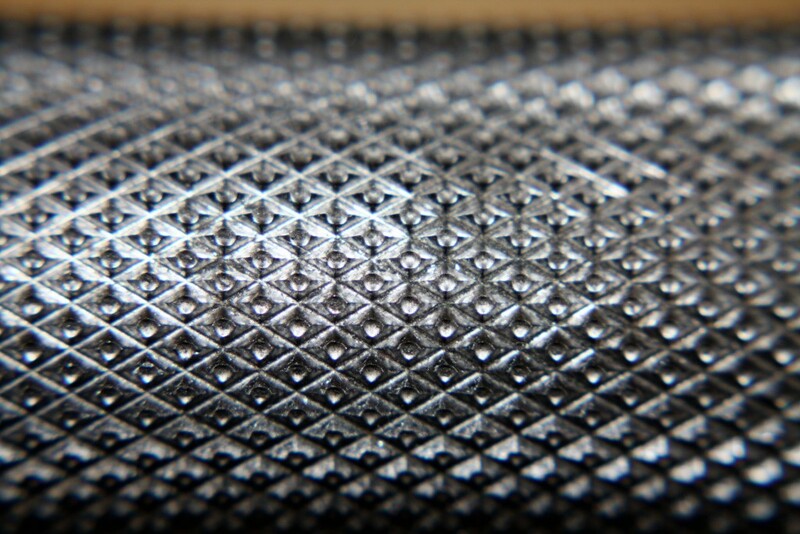 The knurling on the bare steel version is particularly impressive. It is extremely aggressive with a deep cut and concave peaks and bites into your skin and simply refuses to let go. 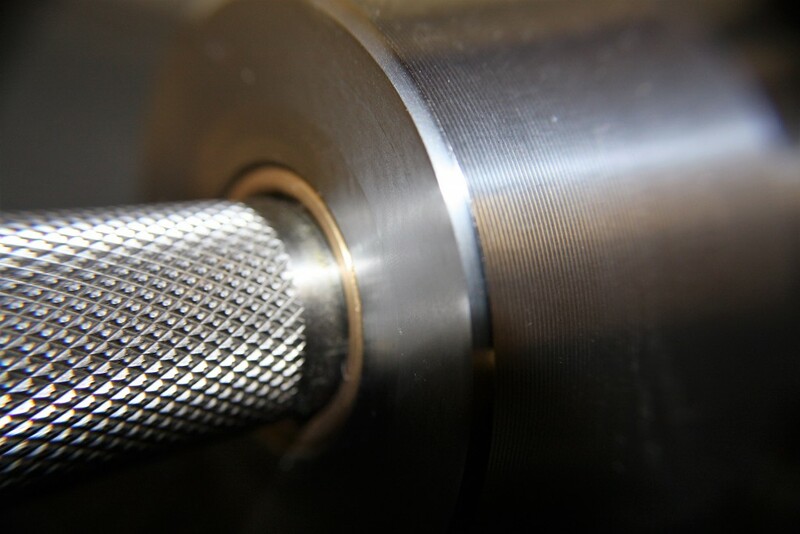 This style of knurling is much nicer and more effective than the full diamond knurl on the large pattern knurling. Chris Duffin calls this “volcano” knurling, and agrees it’s superior to full peak (“pointy mountain”) or shallow cuts (“hill”). It holds chalk really well, and as long as you grip the bar tightly it simply won’t slip out of your hands. This very aggressive grip lets you attack your deadlift with confidence. If you opt to get the zinc coating it will make the knurl feel slightly more mild since the coating will fill in some of the knurling. Rogue comes in at $295 for bare steel or $355 for black zinc with ~$15 shipping. The Texas Power Bar is the same $400 +~$60 shipping as the Okie, but comes with black oxide finish. Black oxide lies somewhere between bare steel and black zinc on the oxidization spectrum and feels much more like bare steel than zinc does. Unfortunately, the oxide coating isn’t terribly durable and will wear off over time in the places it is handled from regular use. Off the bat, the Texas Deadlift Bar is priced at a significant premium compared to the Ohio Deadlift Bar at roughly $150 more than the bare steel version (nearly a 50% premium!). The Texas Deadlift Bar has pinned sleeves instead of the Ohio Power Bar’s snap rings. The pinned sleeves aren’t as snug of a fit as the snap rings meaning the sleeves on the Buddy Capps have some play in them while the Rogue has tighter tolerances and thus no play in the sleeves. The knurling on the Buddy Capps isn’t as deep or aggressive as the Rogue either. It does have bronze bushings like the Rogue. While the Texas Deadlift Bar is finished significantly better than the Okie, it still falls short of the Rogue. The Buddy Capps has the same 27mm shaft diameter as the Rogue and the same 56” between collars, but the 1” thicker collars give the plates a little more leverage and leads to the Buddy Capps having a little more deflection. World class powerlifter Jonathan Harder measured the flex of several deadlift bars by loading 675lbs of regular York plates (not thin competition disks) on the bar, using a car jack to lift the barbell until the last plate just broke the floor, and taking a manual measurement at the apex of the bar to determine which bar flexed the most. The Okie and the Rogue both had 11 3/8” of displacement as measured from the floor to the bottom of the bar while the Buddy Capps had 11 ¾” of displacement. While the absolute level of additional flex will vary based on the amount of weight being used and the thickness of the plates, the Texas Power Bar will always have relatively more flex than its competition. If you want the best value or the highest quality finish in your bar, the Rogue Ohio Deadlift Bar is clearly the better option. If you’re trying to maximize “cheaty mode,” the slightly greater flex on the Texas Power Bar will let you get just a little more ROM reduction than the Rogue. After using my Rogue Ohio Deadlift Bar for nearly a year and a half, I’ve grown to appreciate this bar quite a lot. It looks nearly as good as it did when it came out of the shipping tube despite me only cleaning it about once and month and pulling on it twice a week every week with reps at 500+ and singles at 600+. Although the deadlift bar is definitely not a necessity, it makes pulling a heavy set feel good, and the grip on a new max alone is worth the price. If you compete in a federation that uses a deadlift bar, it will improve your form to practice on the same equipment you’ll use in competition. One final nugget for you: I mentioned a weak grip earlier in the review. If you’re someone who read that and thought “hey, that’s me,” then I highly suggest you start adding in some grip-specific training to bring up any weaknesses you have right now. I’m a huge fan of grippers like the Captains of Crush from Iron Mind, but you can also add static holds on your last deadlift rep – just stand there and try to hold your last rep for 30 seconds. Shoring up those weaknesses will help you pull more if grip is indeed a weakness for you. You’ll still benefit from the additional grip that the deadlift bar will give you though so you should still consider adding it to your barbell arsenal! You can get the Ohio Deadlift Bar from Rogue Fitness. Nikita also did a side by side comparison of the Ohio Deadlift Bar and Texas Deadlift Bar at her gym.